Flight case castors with elastic rubber wheels. Extremely durable and shock absorbent. 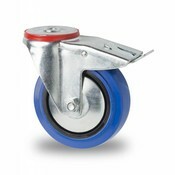 These flight case castor wheels can hold up to 180 kg each. 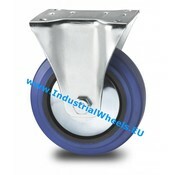 This is the most popular castor wheel in the entertainment industry. 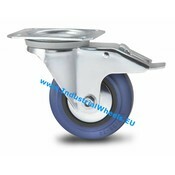 These flight case castor wheels have excellent rolling capabilities thanks to the elastic rubber wheels. The elasticity guarantees a smooth ride and makes it easy to roll equipment over cables, thresholds and other obstacles. 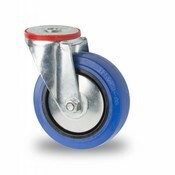 Our flight case wheels can hold up to 180 kg each. 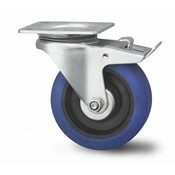 These wheels are most commonly used for flight cases carrying stage equipment. 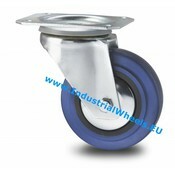 They're also widely used for roll cage containers and other kinds of indoor transportation such as trolleys and carts.